Unless your old carpet is beyond repair, our experts will never convince you to replace them. If your carpet is in workable condition, with minor concerns like stains, loose fitting carpets, or scuff marks on them, our team will definitely recommend carpet repairs over carpet replacement. If your carpet is pulling away from the seams, or you have a loose carpet from wear and tear, don’t worry. Our team of experts handle carpet stretching, stain removal and carpet repairs, so your carpet looks clean and brand new in no time. We serve Waldorf, MD and the surrounding areas, including St. Charles, La Plata, Indian Head, Calvert County, and Prince Frederick, MD. 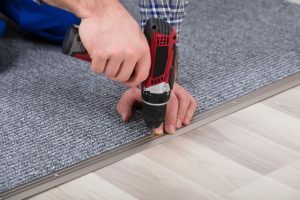 If you reside in or around Waldorf please give us a call, we are your go-to flooring contractor for carpet repairs and carpet stretching services that are super affordable and backed by a one year warranty.